For patients who want to correct their dental alignment, but prefer a more natural look, Dr. Zamora offers the Clear Correct® System which straightens teeth with an almost invisible appearance from his modern and welcoming practice conveniently located in the Mission District of San Francisco, CA. "Excellent service and customer care! Highly recommended." 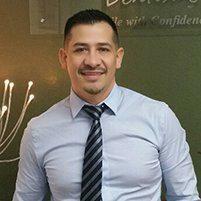 "Dr. Zamora is a confident and very knowledgeable dentist. I highly recommended him." "Muy buen trabajo! Fascinada excelente atencion y muy amables. Buenos planes de pago"
Clear Correct® is an orthodontic system similar to traditional braces, used by dentists to straighten a patient’s misaligned or overcrowded teeth. The Clear Correct® system is different from metal braces in that the straightening is completed with the patient wearing the aligner, which snaps over the teeth and pushes the teeth into the correct alignment, in a manner similar to braces. They are made from clear, BPA-free medical plastic and they are virtually invisible when being used. The aligners can be removed for eating, brushing and flossing, but should be worn for at least 22 hours per day. The Clear Correct® aligners are designed to tightly mold to the patient’s teeth and mouth. The patient may be fitted for new aligners every two or three weeks throughout the treatment as the teeth move into the desired space. How Do the Aligners Straighten Teeth? Like traditional braces, Clear Correct® aligners gently push the teeth into the correct position. However, while traditional braces attach to the teeth with connecting wires which are tightened and adjusted regularly, the Clear Correct® system is a tight, clear shell worn over the teeth. Most Clear Correct® patients wear the aligners for about a year and are often prescribed a retainer to wear when the teeth have been corrected. However, the exact time frame and number of aligners will depend on the patient and the expected result. For the best results, the aligners should be worn for 20-22 hours a day and only be removed to be changed out, while brushing and flossing, or if certain foods are consumed. The aligners will be replaced and refitted approximately every two or three weeks. They are comfortable to wear and will not scratch or irritate the inside of the cheeks like traditional metal braces. What are the Advantages of the Clear Correct® System? The Clear Correct® system of teeth straightening has a number of advantages. The aligners are more or less invisible, which makes it very appealing to patients who might feel self conscious about having their smile filled with metal. Also, the aligners can be removed occasionally, making brushing and flossing a quicker and more straightforward process. Also, since the aligners are changed every few weeks, there is no painful tightening of wires that can irritate the patient’s mouth.